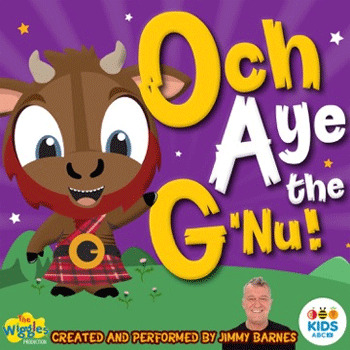 Legendary Australian rocker Jimmy Barnes is excited to announce his new venture into the world of children's entertainment with -Och Aye the G'Nu.' This exciting double release comprises an album featuring the world's most popular children's group, The Wiggles, out March 31st via ABC/Universal Music, and children's books out April 1st via Five Mile Press. With -Och Aye the G'Nu', Jimmy put pen to paper to create truly unique poems inspired by his grandchildren, especially his cheeky red-haired, blue-eyed grandson, Dylan. The music release also showcases the best of Jimmy teamed up with The Wiggles in an album that will be sure to excite and entertain young audiences all over the world. Jimmy explains- 'It has been such an honour and a pleasure to work with my old friends The Wiggles, on this project. Anthony is the best in the world in this field and he guided me through this project every step of the way. We had a lot of fun doing it too. -Och Aye the G'Nu was written for my grandchildren, especially my cheeky little red headed Scot. Glasgow holds a special place in my heart and it was also inspired by my love of Scotland". All seven poems within the poetry collection are Illustrated by the inimitable Kat Chadwick, the story follows G'Nu, a happy young wildebeest who lives in Glasgow Zoo with his very best friend, Kangaroo, as they set off on adventures far and wide. A CD of Jimmy reading the poems is included in the back of the book, so kids and loved ones can recite the poems together, creating a beautiful extension to the storytelling. 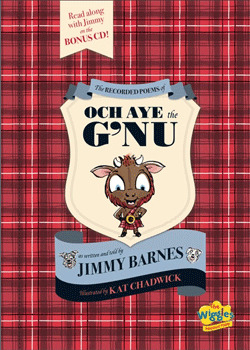 A limited number of signed copies of The Recorded Poems of Och Aye the G'Nu (red cover) will be available from ABC Shop (online) and book retailers. In addition to the deluxe collection, there is a separate book that features the introductory poem 'Och Aye the G'Nu", beautifully presented with colourful illustrations throughout. The album of music coinciding with the release of the book was produced by The Wiggles' creator and Blue Wiggle, Anthony Field. Anthony and Jimmy formed their dynamic duo through a shared love of infectious melodies and music that makes children and parents alike want to sing and dance along. Lachy, the Purple Wiggle, sings beautifully on the album, while Jimmy is the voice of his cheeky character Och Aye the G'Nu. Jackie Barnes and former Purple Wiggle, Jeff Fatt, add to the musical merriment, while Yellow Wiggle, Emma, and Red Wiggle, Simon, are also joined by most of the Barnes family for star performances that will captivate children and families everywhere. After working on the project, Anthony Field said; "The songs on 'Och Aye the G'Nu' are absolutely beautiful, they come from Jimmy's heart. There's also a great sense of fun, perfect for the young listener. Every morning we'd come into the studio and be so excited, we knew we were working on a very special project for children. It was one of the greatest experiences working with Jimmy." Children can join Och Aye and march their energetic little feet to songs including 'I'm a G'Nu", they'll adore moving just like a wildebeest dancing to 'Shake Your Shaggy, Shaggy Mane", as well as pursing their lips and playing along with 'My G'Nu Kazoo" and stomping around with 'I Got New Shoes". It's music that will appeal to both children and the child in you. Jimmy Barnes is a Scottish-born rock singer–songwriter. His career as a solo performer and the lead vocalist of the legendary band Cold Chisel has made him one of the most successful and distinctive artists in Australian music history. A prolific songwriter and performer, Jimmy has been a storyteller for more than 40 years, sharing his life and passions with Australians of all ages at over ten thousand gigs throughout his adopted homeland. He has amassed more #1 albums in Australia than The Beatles, has sold over 12 million albums and has been inducted into the ARIA Hall of Fame twice. In 2016 he published his bestselling memoir, -Working Class Boy'. -Och Aye the G'Nu' is his first release for children. The Wiggles have recently celebrated 25 years of entertaining millions of fans across the globe. They now have more than 385,000 social media followers and have sold over 23 million DVDs, 7 million albums and 8 million books. More than 70 CD and DVD releases later, The Wiggles have earned 18 x gold, 12 x platinum, 3 x double-platinum and 10 x multi-platinum awards for their music and DVD sales and have been awarded 13 x ARIA Awards for Best Children's Album (making ARIA history as the most awarded ARIA winner in the one category, and being inducted into the ARIA Hall of Fame).